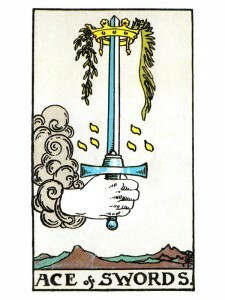 The Ace of Swords imparts Intellect, true perception and mental clarity. Your mind is balanced, receptive and has moved through doubt and confusion into expanded awareness. The beginning or successful completion of mental matters to the highest standards. The arrival of new concepts or proposals. Intellectual fulfillment, perfection, blessings – awards for mental achievement. Clarity of thought. Peel away the masks now – cut through the “illusions” and analyze what needs to be done using your logic. Take the necessary steps to implement your ideas and actualize your important dream or purpose. Believe in your minds ability to be brilliant, let it shine through your passion and interest. Judge the pros and cons of various methods, research the information you need and cut through the unnecessary details. Keep focused on the point and develop your idea systematically. Success is now taking root – STOP WORRYING – this is the beginning of something new. Put all your energy into new plans and new ideas. Keep your thoughts on the happiness of tomorrow – you can make it happen if you want to. Wisdom leads you beyond the illusions and limitations to the spiritual truths contained within life. Intellect alone, without intuition – leads only to more illusion. You need LOVE if you wish to find spiritual truth. Your intellect takes you beyond the “immediate” emotional experience – truth and awareness come from a deeper level of spiritual values and experience, leading you back to Spirit. Your emotions are a “gift”, they enable you to experience life intensely while they remain hard to hold on to and even harder to direct. Your intellect helps you pierce through the fog to give you a clear understanding of the real facts. You are highly analytical, rational, self-assured now. You have developed excellent communication, administration and teaching/learning skills. Intense focus on what interests you will bring insightful clarity. Trust your imagination, become creative and open your mind. Use your logical reasoning to put your ideas into a workable order – then refine them so that they appeal to others. Allow your Throat Chakra to open and develop, for it connects you to the shaft of light which illuminates the mind and aligns the seven chakras with words of truth. Your communication becomes visible, conscious and delivered through external means. Your mind knows the truth and the information you are receiving is reliable. Next to World: You are reluctant to accept the advice of others, considering any offer of help as interference. Correct this obstinate attitude. Next to Hierophant: Do not divide your concentration – set your sights on one specific goal, then center all your energy on it and your life will improve. Next to Wheel of Fortune: Each turn “appears” to be a dead end – you are feeling hopeless, like there is no way out. It is time to begin again – this time don’t be distracted from your goal. In the first position: Yours is to transmit from above to below – the role of the scribe, prophet or communicator. Your life purpose will seem to be that of observer as you allow yourself and your energy to help get the message across to your fellow man. In the second position: Originality, appropriateness of ideas. Profound knowledge of the body, finances, business, the workings of nature and such. Good education, communication, organizational skills. Mental leadership. In the third position: Be assertive. Communicate now what you already know or have planned. Use the kundalini energy from your healthy alignment of opened chakras. Intuition is vivid and reliable. Guides may be very obvious or even visible. In the fourth position: Your first love belongs to the mental level, not the emotional. A passion for knowledge, order and discipline, seeing things work well. You enjoy communicating in all its forms – talking, writing, computers. Facilitating the exchange of ideas propels you. Your personal loves and family life must satisfy these criteria. In the fifth position: Present idea is on target and confidence is appropriate. New input is reliable – you can accept responsibility. You are moving correctly and timely in accordance with your beliefs and they are centered with universal truth. In the sixth position: Impact of mental clarity, new ideas or realization of long held goal on the Emotional Plane affecting relationships and/or creativity. A breakthrough in understanding your emotions. Clarity and order prevail as light is shed on previously dark corners. In the seventh position: Lower and higher mind meet, as ego comes to grips with Ego. You are pulled to higher sources of knowledge. Ending of old, beginning of new, mental endeavors. Universal truth asserts itself on your personal path, as you see more clearly than ever before, using the sword to lift the veil. In the eighth position: Body very healthy in support of clear thinking. Timing good for major step forward with plans. Order and discipline prevail. Major completion/new beginning involving mental disciplines in your Physical Plane. Beginning yoga, meditation, new education, new schedule, new careers related to the Suit of Swords are examples. Healthy criticism, discernment in effect. In the ninth position: Heart, subconscious, gut feelings strong and sure on the reliability of present situation or question at hand. Deep inside, you are confident and want to act. Idea developing in back of your mind, put forward by your heart. Instincts are accurate. In the tenth position: A mental breakthrough lies ahead, within a year at the most. Bring divergent thoughts under one roof and organize for better control and more efficient output.